This indicator analyzes in parallel the moving average for multiple currencies and timeframes. It sends a notification when the trends are in alignment for all timeframes. 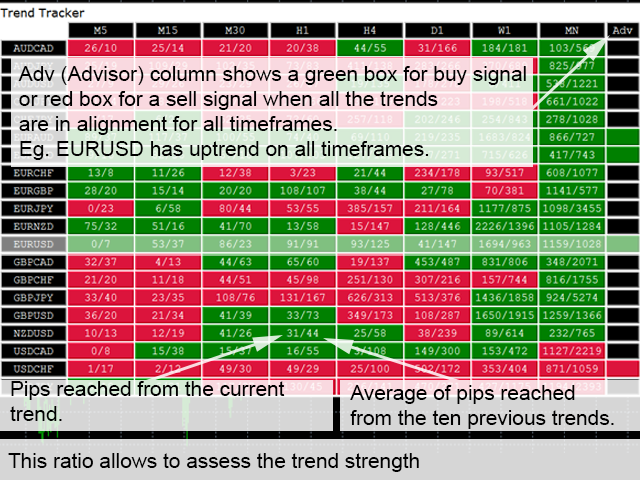 To get better assessment of the trend strength, it shows as well a ratio between the number of pips reached from the current trend and the average of pips reached from the previous trends. I agree with 7769.It is a good indicator for scalping. What make it different from other multi pairs and timeframes indicator is that it should average of last 10 trends which help to decide TP and stoploss. Need a improvement. Author informed about it. Hopefully he will enhance it. I am using this for Scalping and it is extremely beneficial in knowing my stop limit and the trend direction.